Being a bodybuilder means taking your health to the next level. Spending hours at the gym, doing the right kinds of exercises, and eating the right diet are all important for bodybuilders to maintain their physique and strength. Another important factor? How much sleep they get. 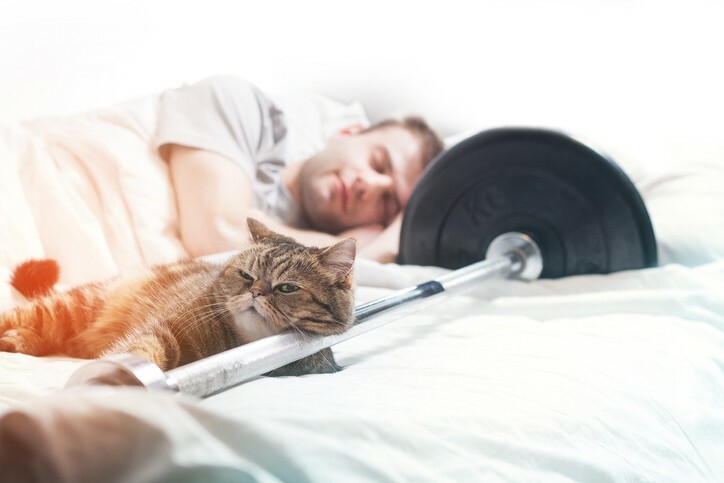 Why is sleep extra important for bodybuilders? Yes, sleep is important for everyone. But if you’re an athlete, every little detail counts when it comes to maintaining your health. In the case of bodybuilders, weightlifting is strenuous on the body, and sleep is the best time for them to recover and build muscle. Sleep is when your body produces a natural growth hormone. That’s why the goal is deep and uninterrupted sleep for a bodybuilder’s muscle building journey. For this reason, it’s important to look at all the factors that could affect their sleep – and that includes the mattress they sleep on. There are several important things to consider in looking for a mattress for bodybuilders, particularly: firmness and support, cushioning, temperature regulation, size, and if there are any bonus features. Let’s look at how the ecosa mattress stacks up as a good mattress for bodybuilders. The right mattress firmness is crucial to getting a good night’s sleep. Too hard and it feels like sleeping on a plank of wood. Too soft and you’ll be sinking right into the mattress. For someone as heavy as a bodybuilder, especially in the 100kg+ range, a soft mattress is not the way to go. Mattresses should support proper spinal alignment while allowing the foam to conform to the shape of a person’s body in just the right amount so the body's pressure points are supported in the right way. Avoid neck and back pain at all costs. For bodybuilders, their body weight would cause a soft mattress to sag, which is not good for several reasons, especially if they’re looking for deep uninterrupted sleep. Medium-firm mattresses or firm mattresses are the way to go. However, mattress firmness is preference, which can also depend on a bodybuilder’s usual sleeping position (on your back, side, or stomach). Just make sure that your body is supported correctly with your spine aligned as much as possible. The ecosa mattress has 3 layers of adjustable firmness levels: medium, medium-firm, and firm. Each layer is engineered to support the spine’s natural alignment while being strong enough to support a bodybuilder’s weight. Just switch out the top layer for another to find the right firmness level for you! Be careful when picking a firmer mattress. While it may support spinal alignment, if a mattress is too firm, it may not form to your body shape and may put unnecessary pressure on certain points on your body. Make sure your mattress is firm while still cushioning your body enough to relieve pressure points. The ecosa mattress has 2 memory foam layers so your bed adjusts to your body shape, providing cushion while still letting you choose your mattress firmness level. The more your work out, the hotter you get – in the literal sense of the word. The more muscle tissue you build, the higher your metabolic rate, and the more energy and heat you generate. Even at rest, that faster metabolism causes people with more muscle to warm up. In the case of bodybuilders who have incredibly low body fat percentages, warm mattresses can cause their bodies to heat up even more at night and keep them from deep sleep. With pin-core holes in every layer, the ecosa mattress regulates temperature by letting air circulate freely while you’re in bed so you can stay cool even while you’re asleep. Bodybuilders come in all shapes and sizes and the right mattress is one that is big enough to support the full length of the body. Don’t pick a new mattress that lets your feet hang off the edge! Choose the bed that cushions pressure points from head to toe so your body is relaxed. Our mattress comes in 7 sizes: single, long single, king single, double, queen, king, and super king. Make sure it’s big enough for you and anyone you might be sharing it with so that there’s no waking up in the middle of the night. The ecosa mattress is waterproof. Technologically designed not to absorb moisture and sweat, you can be sure that your mattress breathes even better, leaving you feeling cool, comfortable, and clean when you go to bed. Every person is different, and even for athletes like them, the best mattress for bodybuilders all comes down to personal preferences at the end of the day. Just remember - poor sleep is bad for muscle recovery. Pick a mattress that is right for your body and it will go a long way. So for all the bodybuilders out there, how does the ecosa mattress stack up? Order one today and we’ll give you a free trial of 100 days to see if it’s right for you. And if it doesn’t work out? No hard feelings! We’ll even pick it up and give you a full refund, no problem (though we doubt you’ll ever want to let it go).